Camden Bike Share Launches May 1st! 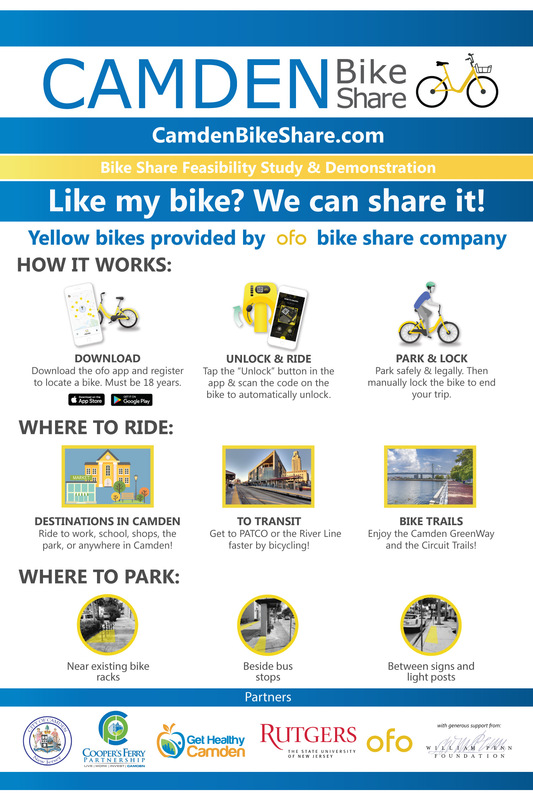 You are here:Home » Blog » Bicycle Sharing and Renting » Camden Bike Share Launches May 1st! Camden will be the latest city in New Jersey to receive a bike-share system, following in the steps of Hoboken, Jersey City, Princeton, and Asbury Park (among others). Unlike those cities, Camden will be using a “dockless” model, provided by the Chinese company ofo. This model allows users to finish their trip anywhere, not just where the city has installed a dock. Other users can then use a smartphone app to find the closest bicycle to them. Riders will be charged only $1 per hour to use the system – no annual commitment required. Additionally, efforts are underway to provide affordable memberships and solutions for Camden residents without a credit or debit card, or smartphone. At launch, 200 bicycles will be introduced in the city. The operations team will take a close look at usage, and will be able to add bicycles throughout the summer if the demand warrants it. On May 1st, a launch event with Mayor Frank Moran will be held at 11am at Roosevelt Plaza Park. The event will include demonstrations with the bicycles, and there will be giveaways. This initiative is just the latest project to help restore economic vitality to Camden. While new commercial developments can be seen around the city, there has also been a strong effort to improve walking and bicycling, such as through the development of the Camden Greenway and the Circuit Trails. 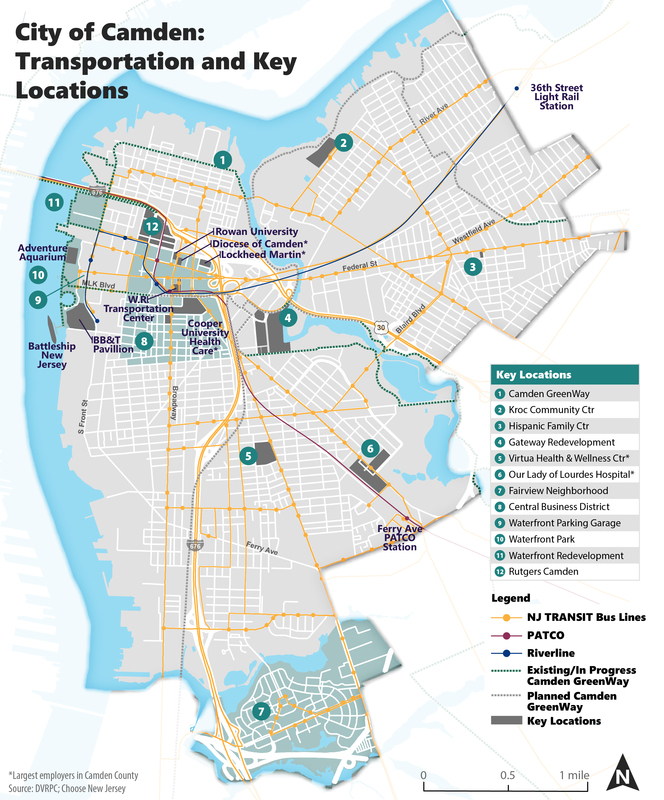 Cooper’s Ferry Partnership hired the Voorhees Transportation Center (VTC) to study the system to determine if the Camden Bike Share helps the residents of Camden to reach jobs, shops, or simply become more active. The results of this study will be incorporated into a business plan that Camden and Cooper’s Ferry Partnership can use moving forward. Bicycles available for the public to use, for a small fee. “ofo” will be providing the bicycles, maintaining them, processing payments, and handing customer service questions. 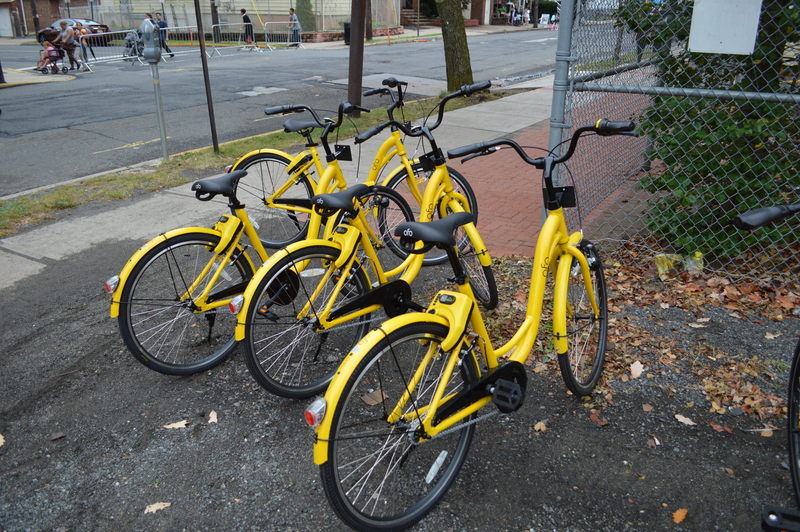 Unlike the systems found in New York City, Philadelphia, and municipalities throughout New Jersey, Camden will be using “dockless” bikes provided by ofo. Most systems require that all bike trips end at a dock, where the bicycle is locked up. In a dockless system, the locking mechanism is built into the bike. This gives users maximum flexibility in ending their trip anywhere they want – not where someone else has decided to install the infrastructure. This allows for maximum flexibility and convenience. As an added bonus, the lack of docks means this model is much cheaper and faster to deploy. Additionally, the system can expand quickly if there is high demand. 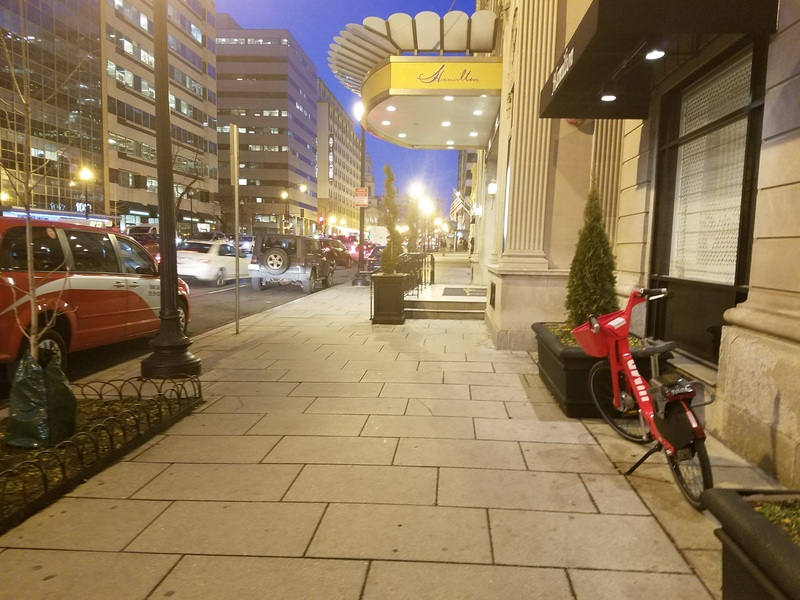 Multiple dockless bicycle share systems currently operate in Washington DC. It is up to the user where they end their trip and lock their bicycle. However, all users are asked to respect their community and show common courtesy. That means not blocking sidewalks, ramps, doorways, or driveways. It also means leaving the bicycle in a public place – not in a backyard. In most cases, users are cognizant of their responsibilities to the community. However, as every bicycle is tracked by GPS, ofo can find and relocate bicycles that haven’t been parked correctly. 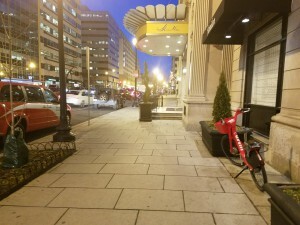 Dockless bicycle share systems have launched in dozens of cities throughout the world, including in Washington DC, Seattle, and Paris. It is incredibly easy to find and unlock a bike! How do you find a bike? 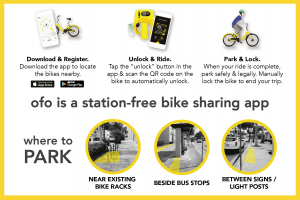 Anyone can download the ofo app, which is available on Apple and Android devices. The app then shows where every bicycle can be found. 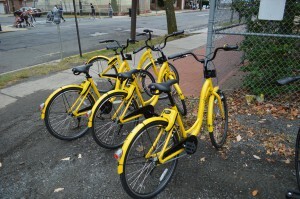 As the ofo bicycles are dockless, their parked locations will change often, although it is expected that patterns will emerge. 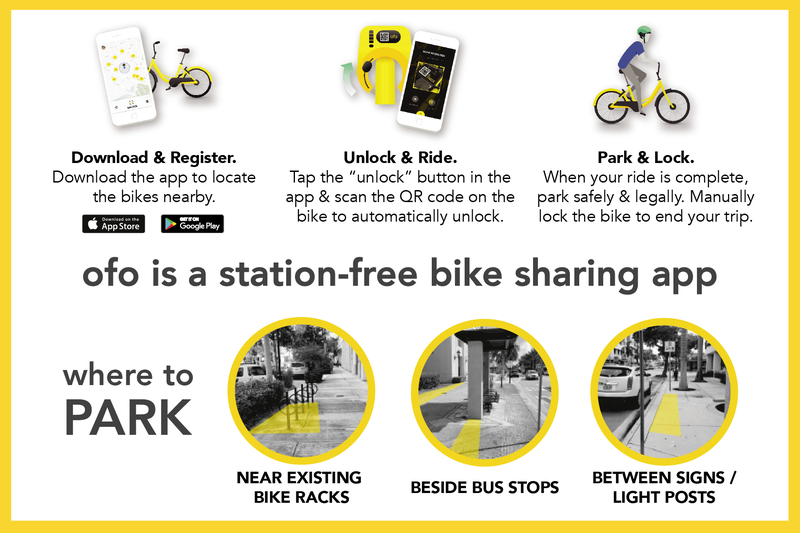 Once you find a bike, you can unlock it using the ofo app. The cost is $1 for the first hour, and then $1 per hour after that. Once you’re done, park the bike in a safe and responsible location, use the built-in lock to stop the timer on the app, and walk away! Map of Camden with key locations. You can ride anywhere within the city limits of Camden. The bikes are equipped with GPS tracking devices so ofo will know if you take the bicycle is taken outside of the service area (please park the bikes within Camden City!). Is this system for everybody? You must be 18 or older to use the system, but bike share is intended to be used by all residents and visitors. However, at launch, a credit card and smartphone are required. Equity is incredibly important to all of the project partners, so work is being done to let those without access to a credit card or smartphone use the system. Additionally, partnerships are being formed to allow low-income residents to have unlimited use of the bicycles for one low cost. Will this work for Camden? Everybody is working hard to make it work for residents and visitors. Bike share has been used around the world to increase mobility and improve public health. However, this program is an evaluation, and the system will be studied to see if it meets these goals. 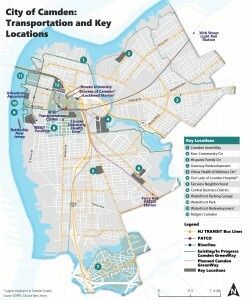 It is possible the evaluation will finish with a recommendation to use a different technology (such as a docked system), or to completely re-imagine how the system works in Camden. Learn more about the program and follow progress on social media!